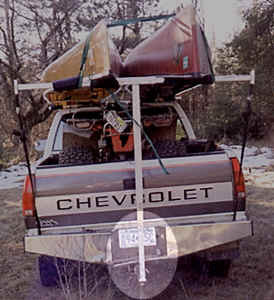 All aluminum hitch rack will allow you to carry up to two canoes or five kayaks by using it as the rear carrier. Use an existing front rack, or add our universal suction cup rack or truck rack for the forward carrier. The longer span can increase stability. It fits into any existing 3/4" hole for accommodating a ball hitch. 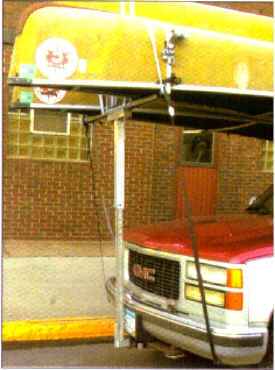 Offset option is available to allow you to still use your hitch to tow a trailer at the same time. 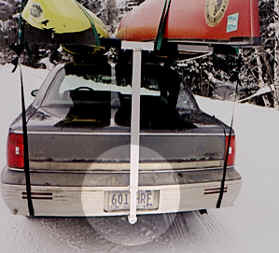 By installing a front hitch to a pickup, you can install the hitch rack as the forward carrier in instances where you need to carry a boat farther forward, such as with a 5th wheel on a pickup bed. Hitch Rack can fit in either a standard bumper hitch or a receiver type hitch. Hitch rack telescopes up to fit the largest pickup height or lower for cars. The top horizontal bar is padded for 36". Telescoping built in extensions extend the width of the top bar to 57" wide. Rack extends up to 66" high, will fit all large size pickups, including Ford 350. By installing a factory front bumper hitch, the Hitch Rack can be installed on the front of a vehicle. LS-4 Load Stops come as a Set of 4. 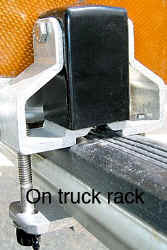 Use them on the TT-2 Truck Rack, The NSC-2 Roof Rack, and the HR-2 Hitch Rack. Prevents your boat from shifting from Side to Side. 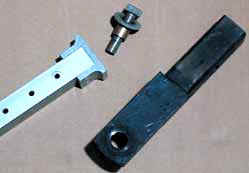 Quickly attaches to most other cross bars. Sturdy aluminum frame with Non-Marring Vinyl Block. Slides to any position on Bar. Fits up to 2-3/4" Wide x 2-1/4" High Square or Rectangular racks and Fits up to 2-1/4" round bars. Use your existing front rack or you can order a single Truck Rack or a single Suction Cup Rack.